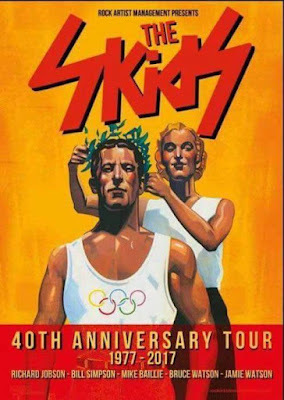 This gig was a real homecoming for The Skids; a long sold-out event in the town where it all began for the band 40 years earlier. Although, Richard Jobson apart, only bassist Bill Simpson was here from that original line-up. Drummer Thomas Kellichan (so Wiki tells us) now runs a bar in Tenerife, whilst Stuart Adamson's sad story should (I hope) already be known to anyone with even a passing interest in the history of rock music in the 20th Century. I was, I have to say, slightly surprised when Jobson re-booted The Skids back in 2007, for what was initially intended to be a one-off T-in-the-Park swansong. Particularly as the singer had spent much of the previous quarter of a century if not quite attempting to airbrush the band out of his own personal history, then certainly pointedly distancing himself from it, as he pursued his media career. But time polishes memories, I suppose, and Stuart Adamson's suicide would, I am sure, have perhaps reminded Richard (if any reminding had been required) that the The Skids had for a couple of years back in the day, been really rather special. And that Green Day/U2 rendition of The Saints Are Coming would have done the band's legacy no harm at all. Augmented by Big Country guitarist Bruce Watson and his son Jamie, The Skids have now been performing sporadically for a decade or so, this gig being part of the band's 40th Anniversary Tour. And it was certainly fun to hear all those old tunes once more. Although nothing from that (ahem) difficult fourth album was aired, perhaps not surprisingly. This being one of those few occasions in life where the adjective “Joyless” was a good thing. My fave Skids' tune Animation opened the show, spoiled a touch by the sound man clearly using this one to hone his mix - with the result the soaring guitar break (played by Bruce Watson this evening), was pretty much AWOL. The guitarist's performance during the rest of the song was hardly helped by his tumbling over and ending up on his back like an upturned turtle – but rather than attempting an undignified scramble back onto his feet, he decided instead to to continue playing from his prone position, with his slightly concerned offspring looking on. This glitch apart, the sound was excellent throughout, Richard's voice particularly so – Working For the Yankee Dollar and Thanatos real high points. Whilst we certainly had to endure some seriously mad Dad-Dancing from Richard, his frantic windmilling somehow (although a far way from cool), did manage to stay (just!) the correct side of embarrassing. And I was more than little impressed he kept his St Vitus birlings up for the whole gig. He clearly is one fit 56-year old. “Much more of this, and I will get a game for Dunfermline” he puffed after a particularly frantic flailing session, “...playing in all eleven positions at once”. I could not argue, for he showed a darned sight more mobility over ninety minutes this evening, than a number of the lumbering lugs whom I saw turning out for The Pars last season. Immersed within the encores was a new 'un – A World on Fire – from a soon to be released new album, suggesting The Skids are clearly intending to stick around at least for a little bit longer. Which is more than fine by me. Richard at one point set a firework off on his head, by sheer willpower. grinning like a six-year old on Christmas morning. Support act were The Filthy Tongues who contain one half, or three sixths, of Eighties band Goodbye Mr Mackenzie. Whilst the rhythm section of Derek Kelly and Fin Wilson both look remarkably untouched the ravages of time, vocalist Martin Metcalf is presently going for the Ron Moody-as-Fagin look. His voice still retained all the power and menace as on those early GMMc releases. The band were promoting the release of their debut album, Jacob's Ladder and performed a number of tunes from it, with the brooding Long Time Dead being the most memorable. The set closed with a couple of GMMc tunes Green Turn Red and Goodwill City - each a reminder of just how good that particular band were. And just how much a mystery it remains, how they failed to make it (whatever "it" actually is). I think this is Susannah Clark - apologies to the lady, if I have her name wrong. her fine contributions only coming to the fore on the final two songs.